This has been one of the best weekends ever! I'm still on a "girl" high and that alone could keep me happy all weekend but we have had so much fun with friends this weekend. Friday night- we went to eat with Jenna, Chris and Brayden to celebrate a week of finding out what our babies are. Jenna and I are both so excited - it's made even sweeter by sharing the frustration of infertility and knowing what a blessing these babies are. Jenna had been baby shopping and she brought me the CUTEST gift - Baby Bling Pacifier and pacifier clip. Will Harper not be precious sporting these two things???? I can't stand it. I have been looking forward to Saturday for weeks!!! I took a little road trip south to Little Rock to visit three of my oldest friends. 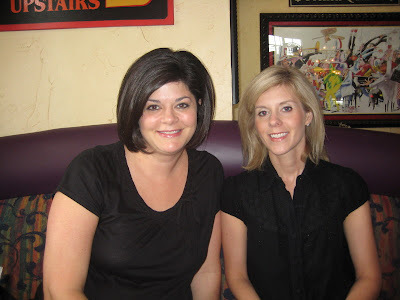 First I met up with two of my best college friends and roommates - Leigh Ann and Kandi for lunch. We stayed at lunch for almost 3 hours just catching up. I love these two girls so much. Kandi gave me this precious sleeper. She said she was trying to be practical - but I think it's so sweet and girly. And Harper can wear it for a long time because it's long with a drawstring. I can't wait to snuggle her up in that this winter. I really went to just visit my friends - I didn't expect them to give me a mini shower but I won't lie and say I didn't love it. I have sat in the nursery today just admiring everything and loving how God has blessed me so much. When I left K&L - I went to visit one of my oldest friends - Jamie. I could have stayed at her house all day too. Jamie is one of the sweetest friends I have ever had and she has two precious children. 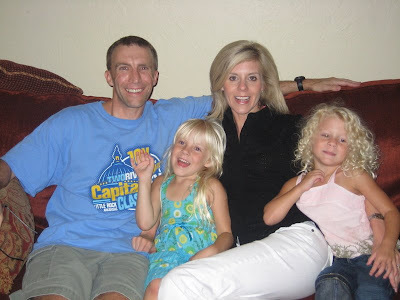 Her husband, Lane, is in med school so he was off studying and we had a great time visiting. 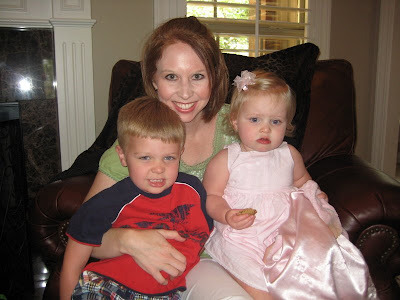 Her kids, Rhett and Alexee, luckily weren't shy and they talked to me and played with me and I was just eating it up!!! I so wish I lived closer so we could spend more time together. Couldn't you just squeeze this little thing to death???? Jamie and I have been friends for about 23 years and I just adore her. She's also one of the most talented people I know and she made me this precious bow holder and I could just dance around with it I love it so much. It's also going to be perfect in the nursery. I'm starting to think when I get the nursery done - you will never get me out of it. I already just go in there and sit and smile and there is nothing in there. ha! Today we got to have lunch with our friends Mike and Kacy and their 2 month old baby Wells. He is also a top prospect for Harper. 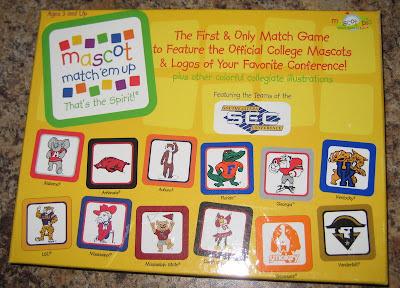 They gave us one of the most fun things I have ever seen and a perfect gift for a child of ours - SEC matching game!!!! I told them that we would start Harper off at birth with these as flash cards and that she and Wells could have contests as soon as they can talk. They will be the two children in the 4 year old Sunday School class talking smack during football season and reviewing games while the other kids are drawing puppies. ha! So glad you had a fun girls day in LR. J sent pics at the beginning of the week of that adorable bow holder..I love it! 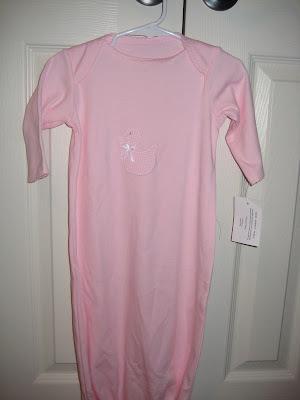 Will be super cute in Harper's nursery. 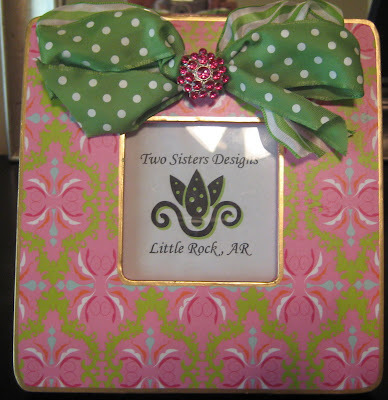 Love the picture frame too. Hope you have a great week and I'm so glad you are feeling better!! The gifts are all so cute! You won't even need a real baby shower... you're getting all your stuff early. Love the SEC matching game! That's hilarious. Sounds like a fun weekend. You got lots of cute gifts. I'm lovin' the SEC matching game. That is too funny. I'm sure my husband doesn't know this exists, or we would own it! Sitting in the nursery admiring and daydreaming is something I completely understand. I did that for months when we were waiting to become foster parents. I would wonder about the children that would sleep in there and how I would love rocking and singing them to sleep. A nursery is a very sweet place to get lost in your thoughts. Glad to hear you had a wonderful weekend! All the gifts are cute, but my favorite is the pacifier.. how cute! Can't wait to see pics of the nursery.. Thanks for the emails!! Have a great rest of your sunday! Looks like you had a great time with your friends :) And I just ADORE The bow holder...so so cute! I can't wait to see more of the nursery! Aww...what sweet stuff! And it sounds like you have even sweeter friends! :o) Little Miss Harper is going to be blessed with lots of wonderful "aunties!" Oh my gosh, that SEC matching game is cracking me up! Love it! Very, very cute! Love the baby stuff - girlie things are so much fun! This post could not have held any more cuteness or adorableness if it TRIED. What a fun weekend with friends!!!! And precious presents to boot! I love it! Kelly! I LOVE all of Harper's goodies! The pacifier is so cute, the bow hanger is so handy and oh so stylish! And Harper had to have the SEC matching game! FUN! Spending time with old friends is absolutely great. 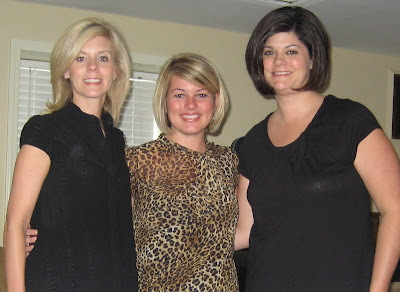 I am glad you had fun with Kandy, Leigh Ann, and Jamie! How fun! Good to talk to you this morning at church! 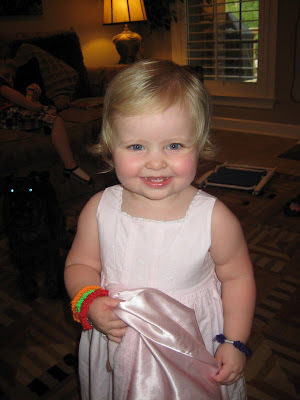 Kelly ~ you are too cute! It literally makes my heart happy to read about you and your baby! You got some precious gifts!! Anytime I get really strong contractions, I go and sit in Kaleb's room and just rock in the glider. Glad you had such a fun "girlie weekend"!! You definitely have some sweet friends! Harper already has a lot of neat things. I've got to find one of those Baby Bling passies for my cousin. I was in LR on Saturday. Too bad we didn't run into each other! What a great weekend! I love the pacifier and the bow holder!! So Cute. We loved having you visit us!!! Hope you will come back soon! I laughed today about what R said about me cleaning their toilet...the way he said it you'd think I never clean! I'm glad the kids weren't shy--that was a true representation of how they act most of the time! Kelly ~ Looks like you had a great time with all of your friends and what wonderful gifts they gave you. Harper will be one very BLESSED little girl. I totally understand hanging out in the nursery. Emma is 14 months old and sometimes I still go in there just to hang out ~ it is by far the cutest room in our house. You are going to be an incredible Mommy! You got the cutest things ever! Jamie, I am making arrangements with you this week to make me a bow holder for Sarah Kate! I LOVE that!!!!!!! Leighann and Kandi-ya'll both look beautiful! I used to sit in Emily's nursery before she was born and just look around and smile. It is such an exciting time! Love the bow holder.......does she have a website?? I had THE best time Saturday. I'm loving that bow holder Jamie made. Super cute! What a great weekend!! A super cute gifts!! Aren't friends the best?! And having them to share in your excitement is double the fun! I LOVE the adorable things you received and am so excited you are getting some awesome stuff for the nursery! Glad you had fun in LR. I am jealous of your day at Jamie's...isn't she just the best. I always leave her house feeling so loved and inspired to be a better mommy, cook, wife, etc!! Harper and Wells sound like a cute preppy couple. I love ALL the girly gifts and really love the game....wish it was ACC!!! all the gifts are sooo cute. and the sec matching game?? ?...i want to play!! Oh how I loved Saturday...kept me smiling all day, even with a cold. Thanks for doing the driving to see us! You are just adorable pregnant. And it made my decade to see you wearing jeans. I can't believe that I didn't point those out to Lowrey while you were here! Oh, and I have to tell you that Lowrey asked me why Miss Kelly wasn't fat. At first I didn't get it and then she said "Miss Kelly has a baby in her belly but she isn't fat!" So THAT should make you feel good! I have just been lurking on all of your blogging friends sites but now that I have seen that bow holder, I am going to have to go visit Jamie. I think the girls' rooms in the new house may need some "Jamie" in them! Wow, do I wish I had her talent. What a GREAT weekend ;)! I can only imagine how happy you are right now...just beaming from ear to ear! That was so sweet of you to visit with old friends!!! cherish your friends during this time! It looks as if you have an amazing support group during the best time of your life. You are so blessed! CUTE stuff! Aren't old girlfriends the BEST?!?! What a great weekend! I love all of Harper's goodies! I definitely think Scarlett's needs a cute little bow holder like that for her new room! Love it! 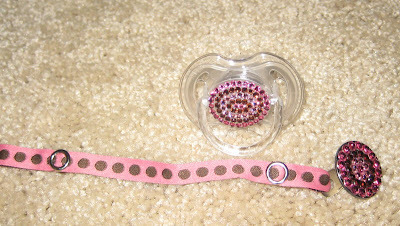 and baby bling paci!!! OH MY! What a great time for you and Scott. Can't wait to read more. It's so nice to meet up with old friends!!! It's sad how life just passes us by and we lose touch! I love all the gifts!!! You have some really WONDERFUL friends!!! and YES- my hubby knows you from college...small world indeed! Wish I would have been there b/c I know we would have been BFF! 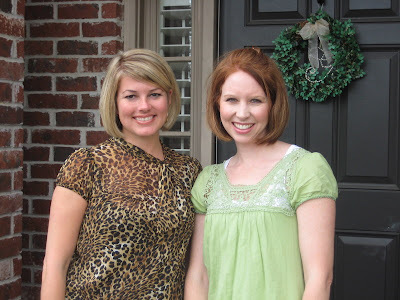 You and Leigh Ann are just the sweetest! Thanks for praying for my baby (I refuse to say "my infertility" but instead am saying "my baby!") and for my horrible headaches! Maybe I can meet you the next time you visit!!! What a wonderful weekend! I am so glad you had a great time with friends - it's hard to beat a girly weekend - I love it! Okay, the bow holder is seriously adorable!!!!! And the sleeper, too snuggly and cute. The frame LAH got you rocks... I just can't wait to see it all come together in the nursery! I am going to have to google the SEC game - what a great gift for football lovers!! !